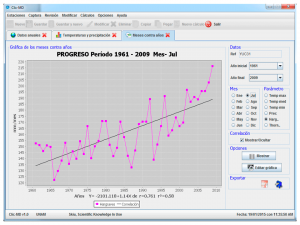 Software Clic-MD, means “Climate change with Monthly Data” http://www.actswithscience.com/moclic222/. 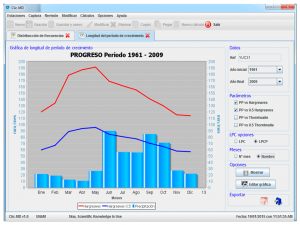 The early versions of Moclic were developed at UNAM and it has been subsequently improved by Skiu. Climate change is a global concern in all areas of life but especially in agriculture, biodiversity and human health. The global discourse has been well understood and disseminated; however, there is little understanding of the magnitude and direction of local climate change. It has been used a global discourse to explain the local effects, which is not always correct. It is at local level where the mitigation and adaptation actions to the adverse effects of climate change are taken, whereby is URGENT the knowledge, using data, from the current local situation to anticipate problems or to take advantage of the opportunities created by climate change. Are there climate changes or is there a normal climate variation? In another words, is there or not climate change by analyzing the available historical data? What kind of climate change is this? By pulse or by gradual changes? In what sense? Is there heating or cooling? Which magnitude or how much? When? And… where? 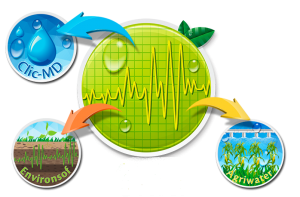 The development of a software that allows the efficient handling of thousands of data to identify the climate and agroclimate changes to generate information to support the implementing of policies to mitigate the negative effects and, if it is the case try to exploit their positive effects. Once with this information, you can identify if there are increases or decreases in temperature and realize its effects in areas such as: human and animal health, agriculture and natural disasters, among other consequences of climate change. Clic-MD allows to store, manage and visualize thousands of climate data in seconds, having a clear idea of the climate trends and extreme data in local, regional or national settings . Economic savings can be obtained using Clic-MD s due to the t support in the decision-making process obtaining accurate data with minimal expenses for example: the analysis of climate data from a single weather station can be done with Excel (saving hiring expenses). However with Clic-MD, once you capture data it’s possible to visualize within 20 minutes 432 graphs and 432 tables with information from each climate stations. This entail economic savings and make the work faster. Clic-MD allows you to know the period of continuous rain, also known as “length of growing period“. It is essential to choose a variety of crops, optimizing the use of rainwater (helping with the conservation of aquifers), which increases agricultural productivity. In the monthly rainfall probability graph, the red line indicates data from the first period from 1960-1990, which could be used as reference period to determine that there is a greater rainfall probability than the blue line that represents 1991 to 2009, which is the first period to compare for the climatic change. Thus, we are able visualize the rainfall probability decrease. 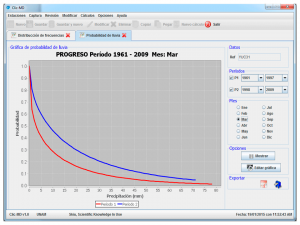 This suitable way of viewing the data let us identify that this doesn´t have a statistically normal distribution. 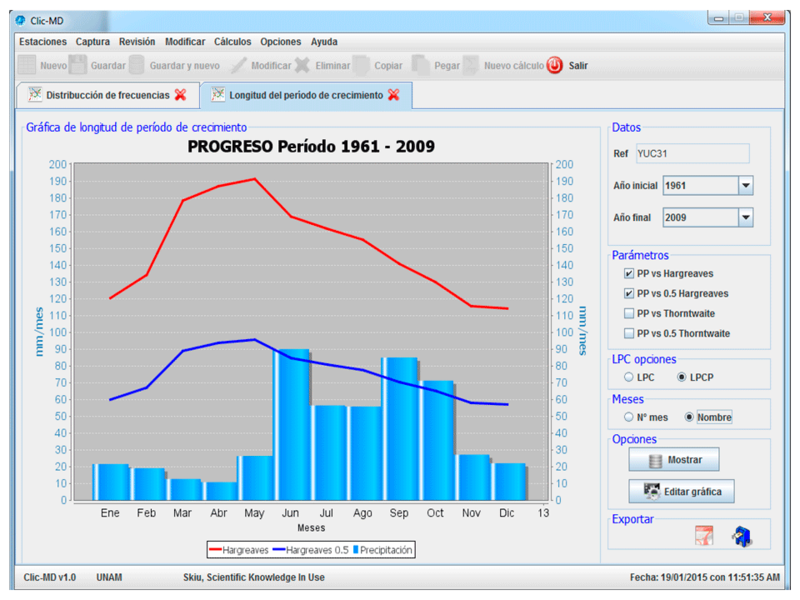 We can also have as an output, the Climo-grams, in the graph we see the blue bars that represent rainfall. Here we have the period 1960-2009 represented in this graph , the red line, indicates maximum temperature, the green one the average and the blue one for low temperatures. 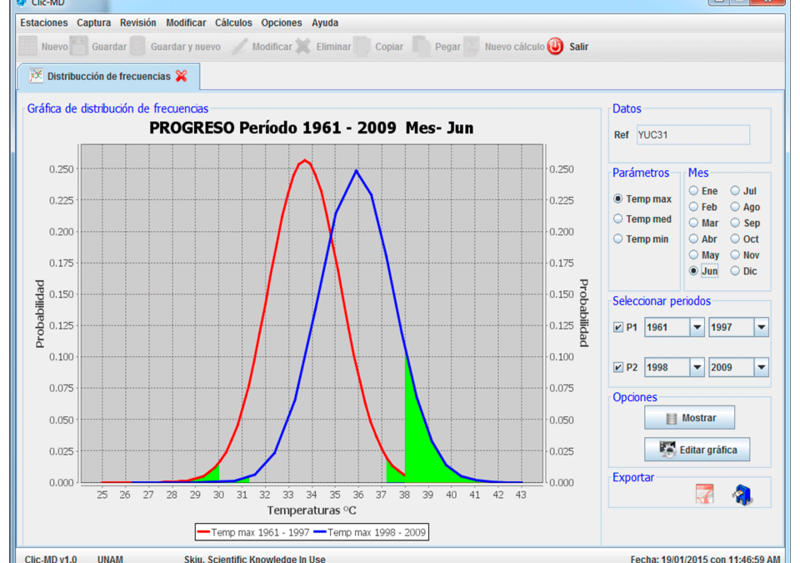 With Clic-MD it is possible to elaborate a climogram for the period of interest. 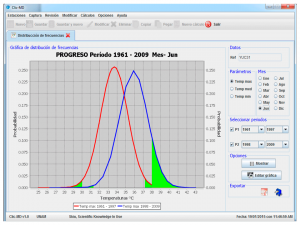 Clic-MD calculates normal distribution graphs of two periods to identify the climate anomalies in the peaks and extreme events in the tails of the graphs. Thus it is possible to see the changes in climate. 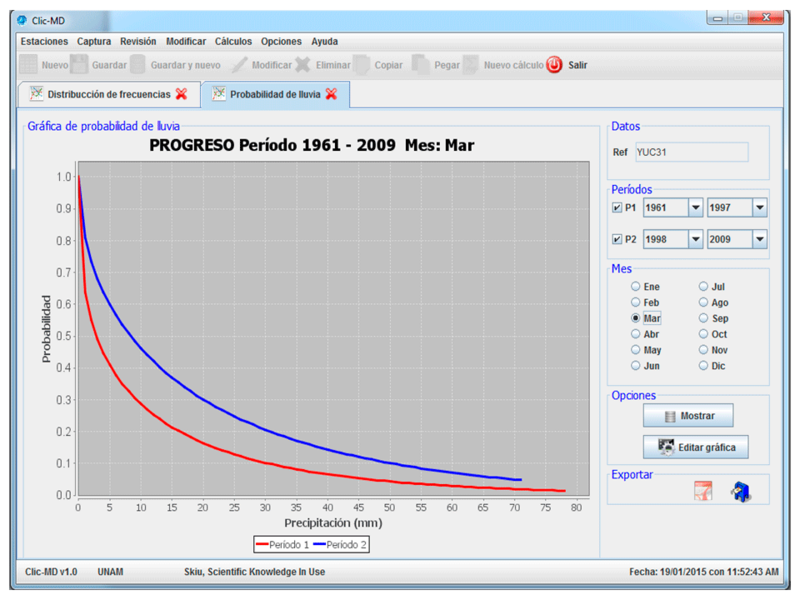 In this example, you can see the movement of the extreme values; the red line is the Gaus bell of the reference period and in blue the comparison period. We can see both the minimum and the maximum values of temperature have moved more to the right, which means, the minimum extreme values have disappeared and the maximum extreme values have increased. The average value has increased from 34.5 to 37 ° C, namely, in this example a weather anomaly of 2.5 ° C in higher maximum temperature is displayed. With Clic-MD it is possible to identify trends in climate change with sequential increase by correlation analysis or changes due to pulses with the Mann-Kendall test. For example, in the Yucatán Abalá weather station there have been identified decreasing trends in temperature in winter, which have negative impacts mainly in the lower-income population. On the other hand, in Mérida Yucatán trends of increased minimum annual temperatures are very clear, as it can be seen in the chart. In the daily life for those that are responsible for making decisions about the provision and adaptation to climate change, Clic-MD will allow them to do their job in a more professional, efficient and timely manner. Also for farmers, Clic-MD will allow them to make an accurate diagnosis about adaptation measures to be taken to address the climate change challenges. To researchers and students, Clic-M will allow them a better quality of their work by analyzing more, better and faster the climate data; and to government agencies, Clic-M will allow them a better understanding of the problems related to climate change at the local level, where decisions are made. So, what does Clic-MD allow? : Generate data for the study of the variability of the weather elements and agro-climatic indices over time either in months or years.